Can be made from most types of fabrics, fleece, of any type, stretch fabrics eg. velour, chenille and flannelette, corduroy and non-stretch cotton fabrics. 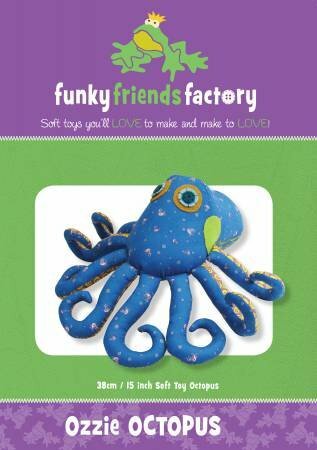 Finished Size: 38cm / 15inch Ozzie Octopus has got to be the Funky Friend with the MOST LEGS EVER!!! He's made with fabric designed by Voodoorabbit who created their 'Cephalopod Collection' JUST for him! This pattern also looks very cute made up in girly colours, so make him a girlfriend too! Finished Size 17"/42cm Mitch the Monkey is the sweetest little monkey. He loves to snuggle up to sleepy children, especially if they feed him bananas for breakfast! He looks fabulous in ALL sorts of colours, not just plain' monkey brown! Finished Toy Size: 15" / 38cm I wanted to make this SEA TURTLE as a boy as he is named after Stu, who is a fabulous Funky Friends Facebook fan, and I have to say, I am very pleased at how nicely he turned out in these bright, bold, boyish colours. He'll make an awesome toy for boys, but I'm sure you can make up a really gorgeous girly pink turtle too! Finished Size: 46cm (18inches) tall, 27cm(11inches) sitting! Slowpoke is a seriously cute, three-toed Sloth who loves snoozing, sleeping and hanging around, chilling out. He’s a simple pattern so you can make a whole sleuth of sloths! He has Velcro claws to attach himself to the nearest siesta spot for a bit of shut-eye. With a sweet smiley face he'll cheer up everyone's day! Melody the Memory Bear A ‘patchwork’ bear is a special memento to cherish as a reminder of your baby’s first years, to mark a special occasion or in memory of a special loved one. Melody is an easy teddy bear pattern without joints. A great way to transform your child's pre-loved clothing into an everylasting keepsake toy. Finished Size: 31cm (12inches) from table to top of head. Prince Charming has many adoring fans around the globe, but he is still waiting for his princess’ kiss. His beanbag belly makes him very posable. He is easy to make with a choice of a very simple felt cutout crown or a more complicated sewn version for the more experienced. Make him for your kids or colleagues. With his googly eyes and plaintiff expression he’ll definitely get his fair share of kisses! There’s nothing ugly about this little duckling! With his adorable pout, this baby duckling will tug on your heartstrings. This easy pattern can be whipped up really quick and makes a really cute baby toy!